Fill in the grid so that every row , every column , and every 3x3 box contains the digits 1 through 9. 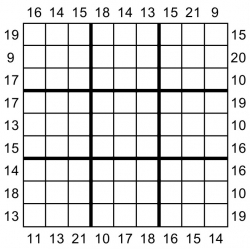 Frame Sudoku consists of an empty grid. Numbers in the outside frame equal the sum of the first three numbers in the corresponding row or column in the given direction.